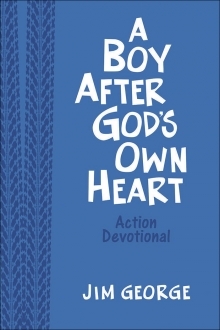 Give a Boy the Gift of Jesus From trusted author Jim George comes this highly giftable devotional dedicated to help tween boys, ages 8-12, grow closer to God. The 140 devotions address every part of a boy’s life, such as making good choices, creating a positive self-image, and developing a deeper prayer life. This age-appropriate collection also includes a clear explanation of the gospel message, making it a perfect choice to give to a boy considering a commitment to Christ. All it takes is a minute or two each day to read these short chapters, and boys will learn how much God cares about them. This handsome devotional makes a great gift for your son, grandson, or other special boy in your life. Help him discover his journey with Jesus is the most important adventure of his life.